The Panic of 1873 was a financial crisis that triggered a depression in Europe and North America that lasted from 1873 until 1879, and even longer in some countries (France and Britain). In Britain, for example, it started two decades of stagnation known as the "Long Depression" that weakened the country's economic leadership. In the United States the Panic was known as the "Great Depression" until the events of the early 1930s set a new standard. The Panic of 1873 and the subsequent depression had several underlying causes, of which economic historians debate the relative importance. American post-Civil War inflation, rampant speculative investments (overwhelmingly in railroads), the demonetization of silver in Germany and the United States, ripples from economic dislocation in Europe resulting from the Franco-Prussian War (1870–71), property losses in the Chicago (1871) and Boston (1872) fires, and other factors put a massive strain on bank reserves, which plummeted in New York City in September and October 1873 from $50 million to $17 million. The first symptoms of the crisis were financial failures in the Austro-Hungarian capital, Vienna, which spread to most of Europe and North America by 1873. The American Civil War was followed by a boom in railroad construction. 33,000 miles (53,000 km) of new track were laid across the country between 1868 and 1873. Much of the craze in railroad investment was driven by government land grants and subsidies to the railroads. At that time, the railroad industry was the nation's largest employer outside of agriculture, and it involved large amounts of money and risk. A large infusion of cash from speculators caused abnormal growth in the industry as well as overbuilding of docks, factories and ancillary facilities. At the same time, too much capital was involved in projects offering no immediate or early returns. A period of post-Civil War economic over-expansion arose from the Northern railroad boom. There then ensued a series of economic setbacks: the Black Friday panic of 1869, the Chicago fire of 1871, the outbreak of equine influenza in 1872, and the demonetization of silver in 1873. The decision of the German Empire to cease minting silver thaler coins in 1871 caused a drop in demand and downward pressure on the value of silver; this, in turn, affected the United States, where much of the supply of silver was mined. As a result, the United States Congress passed the Coinage Act of 1873, which changed the country's silver policy. Before the Act, the United States had backed its currency with both gold and silver, and it minted both types of coins. The Act moved the United States to a 'de facto' gold standard, which meant it would no longer buy silver at a statutory price or convert silver from the public into silver coins (though it would still mint silver dollars for export in the form of trade dollars). The Act had the immediate effect of depressing silver prices. This hurt Western mining interests, who labeled the Act "The Crime of '73". Its effect was offset somewhat by the introduction of a silver trade dollar for use in Asia, and by the discovery of new silver deposits at Virginia City, Nevada, resulting in new investment in mining activity. But the coinage law also reduced the domestic money supply, thereby raising interest rates and hurting farmers and anyone else who normally carried heavy debt loads. The resulting outcry raised serious questions about how long the new policy would last. This perception of instability in United States monetary policy caused investors to shy away from long-term obligations, particularly long-term bonds. The problem was compounded by the railroad boom, which was in its later stages at the time. In September 1873, the U.S. economy entered a crisis. In September 1873, Jay Cooke & Company, a major component of the United States banking establishment, found itself unable to market several million dollars in Northern Pacific Railway bonds. Cooke's firm, like many others, had invested heavily in the railroads. At a time when investment banks were anxious for more capital for their enterprises, President Ulysses S. Grant's monetary policy of contracting the money supply (again, also thereby raising interest rates) made matters worse for those in debt. While businesses were expanding, the money they needed to finance that growth was becoming scarcer. Cooke and other entrepreneurs had planned to build the second transcontinental railroad, called the Northern Pacific Railway. Cooke's firm provided the financing, and ground for the line was broken near Duluth, Minnesota, on 15 February 1870. But just as Cooke was about to swing a US$300 million government loan in September 1873, reports circulated that his firm's credit had become nearly worthless. On 18 September, the firm declared bankruptcy. 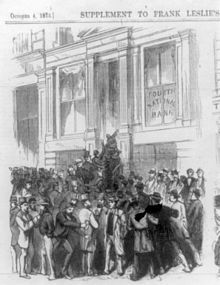 The failure of the Jay Cooke bank, followed quickly by that of Henry Clews, set off a chain reaction of bank failures and temporarily closed the New York stock market. Factories began to lay off workers as the United States slipped into depression. The effects of the panic were quickly felt in New York, and more slowly in Chicago, Virginia City, Nevada (where silver mining was active), and San Francisco. The New York Stock Exchange closed for ten days starting 20 September. By November 1873 some 55 of the nation's railroads had failed, and another 60 went bankrupt by the first anniversary of the crisis. Construction of new rail lines, formerly one of the backbones of the economy, plummeted from 7,500 miles (12,070 km) of track in 1872 to just 1,600 miles (2,575 km) in 1875. 18,000 businesses failed between 1873 and 1875. Unemployment peaked in 1878 at 8.25%. Building construction was halted, wages were cut, real estate values fell and corporate profits vanished. In 1877, steep wage cuts led American railroad workers to launch the Great Railroad Strike. This stopped trains all across the country. President Rutherford B. Hayes sent in federal troops to try to stop this. In July 1877, the market for lumber crashed, leading to several Michigan lumber companies going bankrupt. Within a year, the effects of this second business slump reached all the way to California. The depression lifted in the spring of 1879, but tension between workers and the leaders of banking and manufacturing interests lingered on. Poor economic conditions caused voters to turn against the Republican Party. In the 1874 congressional elections, the Democrats assumed control of the House. Public opinion made it difficult for the Grant administration to develop a coherent policy regarding the Southern states. The North began to steer away from Reconstruction. With the depression, ambitious railroad building programs crashed across the South, leaving most states deep in debt and burdened with heavy taxes. Retrenchment was a common response of southern states to state debts during the depression. One by one, each Southern state fell to the Democrats, and the Republicans lost power. The end of the crisis coincided with the beginning of the great wave of immigration into the United States, which lasted until the early 1920s. The panic and depression hit all industrial nations. A similar process of over-expansion took place in Germany and Austria, where the period from German unification in 1870–71 to the crash in 1873 came to be called the Gründerjahre ("founders' years"). A liberalized incorporation law in Germany gave impetus to the foundation of new enterprises, such as the Deutsche Bank, and the incorporation of already established ones. Euphoria over the military victory against France in 1871 and the influx of capital from the payment by France of war reparations fueled stock market speculation in railways, factories, docks, steamships – the same industrial branches that expanded unsustainably in the United States. It was in the immediate aftermath of Otto von Bismarck's victory against France that he began the process of silver demonetization. The process began on 23 November 1871 and culminated in the introduction of the gold mark on 9 July 1873 as the currency for the new united Reich, replacing the silver coins of all constituent lands. Germany was now on the gold standard. Demonetization of silver was thus a common element in the crises on both sides of the Atlantic Ocean. On 9 May 1873, the Vienna Stock Exchange crashed, unable to sustain the bubble of false expansion, insolvencies, and dishonest manipulations. A series of Viennese bank failures ensued, causing a contraction of the money available for business lending. One of the more famous private individuals who went bankrupt in 1873 was Stephan Keglevich of Vienna. He was a relative of Gábor Keglevich, who had been the master of the royal treasury (1842–1848), and who in 1845 had founded, with some others, a financing association to fund the expansion of Hungarian industry and to protect the loan repayments, similar to the Kreditschutzverband of 1870 (Austria's association for the protection of creditors and for the protection of the interests of its members in cases of bankruptcy). That made it possible for a number of new Austrian banks to be established in 1873 after the Vienna Stock Exchange crash. In Berlin, the railway empire of Bethel Henry Strousberg crashed after a ruinous settlement with the Romanian government, bursting the speculation bubble in Germany. The contraction of the German economy was exacerbated by the conclusion of war reparations payments to Germany by France in September 1873. Coming two years after the foundation of the German Empire, the panic became known as the Gründerkrach or "founders' crash". Keglevich and Strousberg had come in the year 1865 in direct competition in a project in today's Slovakia, whereupon, in 1870, the Government of Hungary and finally in 1872 the Emperor-King Franz Joseph I of Austria resolved the question of these competing projects. Although the collapse of the foreign loan financing had been foreshadowed, the anticipatory events of that year were in themselves comparatively unimportant. Buda, the old capital of Hungary, and Óbuda were officially united with Pest, thus creating the new metropolis of Budapest in 1873. The difference in stability between Vienna and Berlin had the effect that the French indemnity to Germany overflowed thence to Austria and Russia, but these indemnity payments aggravated the crisis in Austria, which had been benefited by the accumulation of capital not only in Germany, but also in England, the Netherlands, Belgium, France and Russia. Recovery from the crash occurred much more quickly in Europe than in the United States. Moreover, German businesses managed to avoid the sort of deep wage cuts that embittered American labor relations at the time. There was an anti-Semitic component to the economic recovery in Germany and Austria as small investors blamed the Jews for their losses in the crash. Soon more luxury hotels and villas were built in Opatija and a new railway line was extended in 1873 from the Vienna–Trieste line to Rijeka, from where it was possible to go by tram to Opatija. The strong increase of port traffic generated a permanent request for expansion. The Suez Canal was opened in 1869. 1875–90 became "the golden years" of Giovanni de Ciotta in Fiume (Rijeka). The opening of the Suez Canal in 1869 was one of the causes of the Panic of 1873, because goods from the Far East had been carried in sailing vessels around the Cape of Good Hope and were stored in British warehouses. As sailing vessels were not adaptable for use through the Suez Canal because the prevailing winds of the Mediterranean Sea blow from west to east, British entrepôt trade suffered. In Britain the Long Depression resulted in bankruptcies, escalating unemployment, a halt in public works, and a major trade slump that lasted until 1897. During the years from 1873 to 1896, a period sometimes referred to as "Long Depression", most European countries experienced a drastic fall in prices. Still, many corporations were able to reduce production costs and achieve better productivity rates, and, as a result, industrial production increased by 40% in Britain and by over 100% in Germany. A comparison of capital formation rates in the two countries helps to account for the different industrial growth rates. During the depression the British ratio of net national capital formation to net national product fell from 11.5% to 6.0% while Germany's rose from 10.6% to 15.9%. In essence, during the course of the depression, Britain took the course of static supply adjustment while Germany stimulated effective demand and expanded industrial supply capacity by increasing and adjusting capital formation. For example, Germany dramatically increased investment with regard to social overhead capital, such as in the management of electric power transmission lines, roads, and railroads, while this input stagnated or decreased in Britain and the investment helped to stimulate industrial demand in Germany. The resulting difference in capital formation accounts for the divergent levels of industrial production in the two countries and the different growth rates during and after the depression. In the periphery, the Ottoman Empire's economy also suffered. Rates of growth of foreign trade dropped, external terms of trade deteriorated, declining wheat prices affected peasant producers, and the establishment of European control over Ottoman finances led to large debt payments abroad. The growth rates of agricultural and aggregate production were also lower during the Long Depression as compared to the later period. The general demonetisation and cheapening of silver caused the Latin Monetary Union in 1873 to suspend the conversion of silver to coins. After the 1873 depression, agricultural and industrial groups lobbied for protective tariffs. The 1879 tariffs protected these interests, stimulated economic revival through state intervention and refurbished political support for the conservative politicians Bismarck and John A. Macdonald (the Canadian prime minister). Chancellor Bismarck gradually veered away from classical liberal economic policies in the 1870s, embracing many economic interventionist policies, including high tariffs, nationalization of railroads, and compulsory social insurance. This political and economic nationalism also reduced the fortunes of the German and Canadian classical liberal parties. France, like Britain, also entered into a prolonged stagnation that extended to 1897. The French also attempted to deal with their economic problems through the implementation of tariffs. New French laws in 1880 and in 1892 imposed stiff tariffs on many agricultural and industrial imports, an attempt at protectionism. The U.S., still in the period after the Civil War, continued to be very protectionist. ^ "What history teaches us about the welfare state". The Washington Post. 29 August 2011. Retrieved 10 September 2011. ^ Loomis (1968), pp. 219–220, 224–225. ^ Silver coinage was resumed under the Bland–Allison Act of 1878. ^ Wheeler (1973), p. 81. ^ Loomis (1968), pp. 119–120. ^ Masur (1970), p. 65. ^ Charles Poor Kindleberger, Historical Economics: Art or Science? Berkeley, CA: University of California Press, 1990; pg. 321. ^ a b Paul Kleppner, "The Greenback and Prohibition Parties," in Arthur M. Schlesinger (ed. ), History of U.S. Political Parties: Volume II, 1860–1910, The Gilded Age of Politics. New York: Chelsea House/R.R. Bowker Co., 1973; pg. 1556. ^ Lord Keynes (2012-01-26). "Social Democracy for the 21st Century: A Post Keynesian Perspective: US Unemployment, 1869–1899". Socialdemocracy21stcentury.blogspot.com. Retrieved 2013-12-08. ^ Among the lumbering firms that failed were the Danaher & Melendy Company and Oliver O. Stanchfield of Ludington, Michigan, and Cushman, Calkins & Company and Tyson, Sweet & Company of Manistee, Michigan. History of Manistee, Mason and Oceana Counties, Michigan (1882), "History of Mason County", p. 50, and "History of Manistee County", pp. 52, 53 (separate pagination). ^ Loomis (1968), pp. 241–243. ^ Masur (1970), pp. 63–65. ^ Charles Savoie (April 2005). "Monetary Madhouse". Silver-Investor.com. Retrieved 10 September 2011. ^ Manchester (1968), p. 135. ^ Marek (1974), pp. 181–182. ^ Masur (1970), pp. 64–65. ^ Historické štúdie, Volume 1–2, p.239, Slovenská akadémia vied, Historický ústav SAV., Československá akademie věd, Vyd-vo Slovenskej akadémie vied, Bratislava 1955. ^ British Economic History, 1870–1914, W.H.B. Court, Cambridge University Press 1965. ^ Marek (1974), pp. 182–183. ^ a b Masur (1970), pp. 74–75. ^ Marek (1974), p. 182. ^ Masur (1970), pp. 75–76. ^ Dienel, Hans-Liudger (2004). Unconnected transport networks: European intermodal traffic junctions 1800–2000. Frankfurt/Main: Campus Verlag. p. 146. ISBN 3-593-37661-X. ^ "Suez Canal | canal, Egypt". Encyclopedia Britannica. Retrieved 2017-11-24. ^ The economic development of the American nation, p. 356, Reginald Charles McGrane, Ginn & Co., Boston 1950. ^ Park, Young Goo (1997). "Depression and capital formation: The United Kingdom and Germany, 1873–96". Journal of European Economic History. 26 (3): 511–534. ^ Pamuk, Sevket (1984). "The Ottoman Empire in the 'Great Depression' of 1873–1896". Journal of Economic History. 44 (1): 107–118. doi:10.1017/S0022050700031399. ^ Eyck (1950), pp. 223–236, 252–261. ^ Masur (1970), pp. 75–80. ^ Richter (1962), pp. 219–220, 255–256. ^ Breton, Yves; et al. (1997). La Longue Stagnation en France: L'Autre Grande Depression, 1873–1897 (in French). Paris: Économica. ISBN 2-7178-3130-4. ^ Marc-William Palen, "Foreign Relations in the Gilded Age: A British Free-Trade Conspiracy?" Diplomatic History 37 (April 2013): 217-247. ^ Morgan, H. Wayne (1969). From Hayes to McKinley: National Party Politics, 1877–1896. Syracuse: University Press. Barreyre, Nicolas (2011). "The Politics of Economic Crises: The Panic of 1873, the End of Reconstruction, and the Realignment of American Politics". Journal of the Gilded Age and Progressive Era. 10 (4): 403–423. doi:10.1017/S1537781411000260. Eyck, Erich (1950). Bismarck and the German Empire. Fawcett, W. L. (1877). Gold and Debt; An American Hand-Book of Finance. Fels, Rendigs (1949). "The Long-Wave Depression, 1873–97". Review of Economics and Statistics. 31 (1): 69–73. doi:10.2307/1927196. JSTOR 1927196. Fels, Rendigs (1951). "American Business Cycles, 1865–79". American Economic Review. 41 (3): 325–349. JSTOR 1802106. Foner, Eric (1990). A Short History of Reconstruction 1863–1877. New York: Harper & Row. ISBN 0060964316. Glasner, David (1997). "Crisis of 1873". In Glasner, David; Cooley, Thomas F. Business Cycles and Depressions: An Encyclopedia. New York: Garland Publishing. pp. 132–133. ISBN 0-8240-0944-4. Kindleberger, Charles P. (2005). Manias, Panics and Crashes: A History of Financial Crises (5th ed.). New York: John Wiley & Sons. p. 137. ISBN 0471467146. Kirkland, Edward Chase (1967). Industry Comes of Age: Business, Labor, and Public Policy 1860–1897. Chicago: Quadrangle Books. Loomis, Noel M. (1968). Wells Fargo. Lubetkin, M. John (2006). Jay Cooke's Gamble: The Northern Pacific Railroad, the Sioux, and the Panic of 1873. Focused on construction in the West. Manchester, William (1968). The Arms of Krupp. ISBN 978-0-316-52940-2. Marek, George R. (1974). The Eagles Die: Franz Joseph, Elisabeth, and Their Austria. Harper & Row. ISBN 978-0-246-10880-7. Masur, Gerhard (1970). Imperial Berlin. New York: Basic Books. ISBN 0465032095. Mixon, Peter (2008). "The Crisis of 1873: Perspectives from Multiple Asset Classes". Journal of Economic History. 68 (3): 722–757. doi:10.1017/S0022050708000624. Moseley, Fred (1997). "Depression of 1873–1879". In Glasner, David; Cooley, Thomas F. Business Cycles and Depressions: An Encyclopedia. pp. 148–149. ISBN 0-8240-0944-4. Musson, A. E. (1959). "The Great Depression in Britain, 1873–1896: A Reappraisal". Journal of Economic History. 19 (2): 199–228. JSTOR 2114975. Oberholtzer, Ellis Paxson (1926). A History of the United States Since the Civil War. 3. pp. 69–122. Persons, Warren M.; Tuttle, Pierson M.; Frickey, Edwin (1920). "Business and Financial Conditions Following the Civil War in the United States". Review of Economic Statistics. 2 (Supplement 2): 5–21. doi:10.2307/1928610. JSTOR 1928610. Rezneck, Samuel (1950). "Distress, Relief, and Discontent in the United States during the Depression of 1873–78". Journal of Political Economy. 58 (6): 494–512. doi:10.1086/257012. JSTOR 1827088. Richardson, Heather Cox (2007). West From Appomattox: The Reconstruction of America After the Civil War. ISBN 978-0-300-11052-4. Richter, Hans Werner (1962). Bismarck. Scott, Ira O., Jr. (1952). "A Comparison of Production during the Depressions of 1873 and 1929". American Economic Review. 42 (4): 569–576. JSTOR 1810159. Unger, Irwin (1964). The Greenback Era: A Social and Political History of American Finance, 1865–1879. pp. 213–228. Wheeler, Keith (1973). The Railroaders. New York: Time-Life Books. White, Richard (2011). Railroaded: The Transcontinentals and the Making of Modern America. ISBN 978-0-393-06126-0.